Intel took half a day this week to talk about processor manufacturing technology. The company still believes in Moore's Law and says the principle will continue to guide and shape the microchip industry. But the way the law works is changing. The company also wants to change how people talk about manufacturing processes, because current terminology—wherein the node size is used to characterize a particular process—no longer serves as a good guide to how many transistors can be packed into a chip. Moore's Law—the observation by Intel co-founder Gordon Moore that the number of transistors in an integrated circuit would double every two years, and correspondingly, the cost per transistor would halve over the same time frame—guided microchip manufacturing for around three decades. During that period, process node shrinks, each one bringing a doubling of the number of transistors by making everything 0.7 times smaller, were all it took to fulfill Moore's Law. Backed by this easy scaling, computer performance increased at a rate unrivaled by any other human technological innovation. This scaling started to falter in the 2000s when it became increasingly difficult to shrink integrated circuits simply by switching to a smaller process node. But this didn't bring about an end to Moore's Law; instead, the industry used additional techniques, such as strained silicon, high-κ metal gates, and FinFETs. 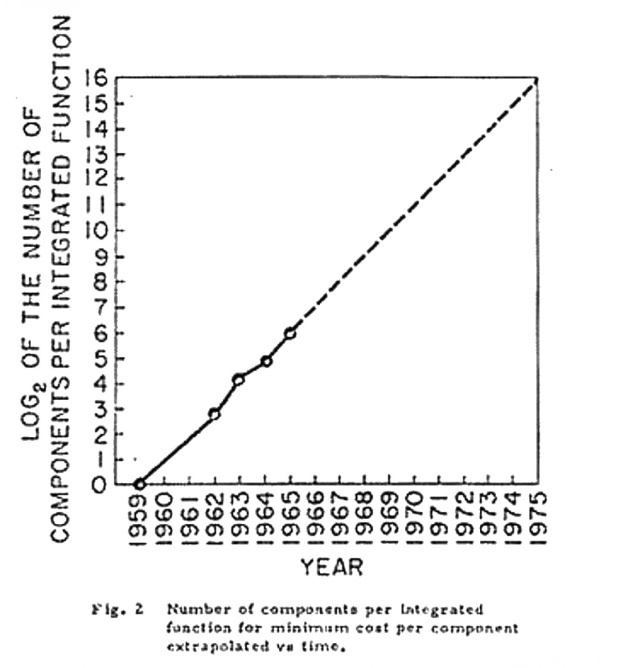 The doubling of transistor density or halving of transistor cost continued to take place every two or so years. Intel's most recent process shrinks, however, have taken an extended period. The company introduced 14nm in September 2014 with the Broadwell processor. Its latest Kaby Lake processors are still built on a 14nm process, and although 10nm processors are due to ship this year, a fourth generation of 14nm chips, Coffee Lake, is also planned. On the face of it, three years between process shrinks, rather than the traditional two years, would appear to end Moore's Law. But Intel claims that's not so. The company says that the 14nm and 10nm process shrinks in particular more than doubled the transistor density. At 10nm, for example, the company names a couple of techniques that are enabling this "hyperscaling." Each logic cell (an arrangement of transistors to form a specific logic gate, such as a NAND gate or a flip flop) is surrounded by dummy gates: spacers to isolate one cell from its neighbor. Traditionally, two dummy gates have been used at the boundary of each cell; at 10nm, Intel is reducing this to a single dummy gate, thereby reducing the space occupied by each cell and allowing them to be packed more tightly. Each gate has a number of contacts used to join them to the metal layers of the chip. Traditionally, the contact was offset from the gate. At 10nm, Intel is stacking the contacts on top of the gates, which it calls "contact over active gate." Again, this reduces the space each gate takes, increasing the transistor density.